I love cookies. Almost every kind. I LOVE oatmeal raisin. It is probably my favorite in general. But my favorite that I make and that would be my first choice if I could always be the one providing the cookies is SUGAR! With BUTTERCREAM frosting! And I’ve been tweaking my buttercream frosting recipe for a long time. I don’t generally use really exact measurements- I’ve been making it long enough to just eyeball. And I don’t always sift the powdered sugar- it depends on how much energy I have or if I’m planning to share the cookies with anyone besides David. And I have two versions- regular and coconut. I used Earth Balance instead of butter and used Ener-G Egg Replacer instead of the eggs. Also, I omitted the nutmeg completely. I used a wide mouth mason jar lid ring for a cookie cutter because I wanted BIG, THICK, ROUND cookies. For my oven, about seven minutes was the maximum these needed to bake to avoid getting too brown on the bottom. I used my own frosting recipe which I will share in a later post (it’s going on my coconut cake for the county fair!). 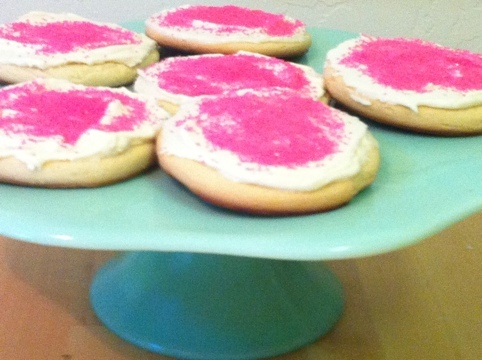 I didn’t have any food coloring but I did have sparkly pink sprinkles! So that’s what I used. I think I like them better with this pink glitter instead of boring old pink frosting! If you like sugar cookies you should really make these! I love sugar cookies, and now I’m craving them! Whenever I see these kind at the grocery store, I keep thinking I need to make a vegan version. Love the cookies! Look delish. Thanks for the recipe. I love baking and have yet to perfect baking Vegan. Yum! Yum!